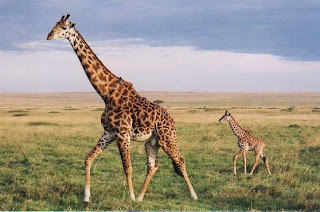 Giraffes (Giraffa camelopardalis) move in loose herds on the open woodlands and grasslands of the African Savannah. Eating mostly at dusk and dawn on leaves and fruit, the Giraffe’s main food source is the acacia tree. They will drink where possible, but can survive where it is in short supply. 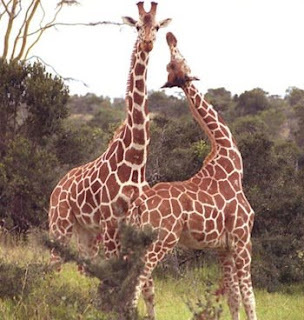 To drink, a Giraffe must spread its front legs so its head can reach the water. It has a distinctive walking style as it moves both legs on the same side forward at the same time. At a gallop, the Giraffe can reach speeds of up to 55 km/hour and rhythmically moves its head backwards and forwards to pull forward its weight. Blog ini unik sekali yah, saya jarang banget mengunungi blog yang bertemakan Flora dan Fauna kayak blog ini.